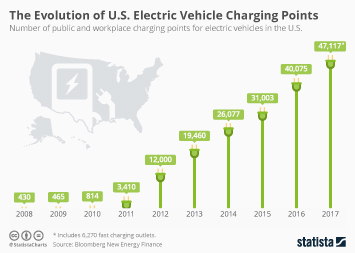 As part of the 2009 American Recovery and Reinvestment Act, the U.S. government invested some 2.4 million U.S. dollars in federal grants to develop the U.S. electric vehicle industry. The government's efforts helped push the U.S. mobility industry forward while creating numerous so-called "greencollar jobs" to aid in the recovery of the American economy. Although plug-in electric vehicle (PEV) sales have almost quadrupled between 2012 and 2017, their share of the market was still a modest one percent in 2017. Although being more environmentally benign in terms of greenhouse gas emission levels, the advantages offered by battery-powered vehicles are set off mainly by high initial costs and limitations regarding battery range, as the distance covered per trip by their internal combustion-propelled competitors continues to be unmatched. Notwithstanding the low market share, manufacturers are continuing to add new electric vehicle models into their range of vehicles offered. Tesla Inc., led by Elon Musk, continues to dominate the U.S. electric vehicle market with over 197,517 electric vehicles sold in 2018 alone. Tesla released their new Model 3 in 2017 in an effort to target more price-conscious EV consumers while attempting to alleviate investor concerns with somewhat disappointing sales of their luxury models, Model S and Model X. Throughout 2017, the company experienced significant production difficulties for the Model 3, which they are still trying to tackle. It appears that Musk will have to answer questions soon as investor concerns are rising over the new model's battery production difficulties.